Here is Kula doing what he loves, swimming after sticks in the river, even when the water gets cold, he is keen for a swim! He is super good at navigating the currents and rapids and knows the commands right or left when he loses track of a stick and I can direct him from the shore! It is excellent that Kula is an extraordinarily good swimmer. Maybe it is extra special that you share the love of the water so much. (Haha) Your two OwyheeStar’s have such an excellent life. Thanks ever so much for everything you do with and for them–as well as sending along the Emailed updates. For those that might not have caught the connection Kula Blue and his sister, Pilikia, were recently featured tucked under the covers enjoying the master’s bed. If you missed that blog–click here. Thank you, for remembering us and sharing this with our audience. We do so appreciate it. It is great to hear that Remy is much loved. Also, that she loves all things water related–she swims. Mostly we love seeing how happy you folks are to have her as a part of the family. We love it when we see the Weimaraner doing whatever with the family–not left behind. We all know that they are in their element when they are with their beloved humans. Yes, Nancy, it is fabulous having the OwyheeStar Facebook Group–it allows people to connect with other OwyheeStar clients. It is a great place to post OwyheeStar Weimar photos. I said OwyheeStar twice–I should mention this group is only for our clients. The regular OwyheeStar Page still works, and it is open to the public for comment. This group is all about our little community. To become a member you must be an OwyheeStar Client–just to clarify for anyone wondering. Once someone posts a story and photos, it seems rather silly of me to grab that information and to repost it on our blog. I can do that. I have done it. I try to avoid doing it–I like to keep the blog newsy, but also fresh and informational. (Haha) I rely on the kindness of our OwyheeStar clients to update me with stories, photos, and achievements. For the most part, people are so very gracious and follow through–but, not always. Regardless, we love the updates. I think you will agree there have been some great group posts. We do so appreciate them. This update, however, is so helpful. Thank you, again for thinking of us. Your help is much appreciated. We are thrilled to see Tikka getting used to the paddle boarding. The water retrieves by both girls (Luna and Tikka) is extraordinary. It looks like everyone had a great time. Now that spring seems to finally be here Loki and I are having all sorts of adventures. For the last month or so I’ve been working on introducing Loki to water. First, it was getting his toes wet, then the ankles, and so on. I’ve attached a video from this evening— we headed out to the lake after work. Needless to say, we’ve come a little ways from not getting our paws wet. You may notice the cord on the bumper— sometimes Loki needs to remember that the game is retrieving, not keep away, but the water work has seemed to really help this. Also great insurance in case he doesn’t go for it, so I don’t have to swim. Other adventures include hide-and-go-seek at lunchtime on a trail system near my office. It’s a great game for anyone to play to help their pup remember to check in on hikes, but with Loki, in particular, we want to develop the idea that he can use his nose to find people. When we’re out on the trail, I wait until he gets just a little too far ahead of me, and I hide in the bushes next to the trail where I can still see him. He is quick to notice that I’m no longer in sight, so he runs back down the trail. He usually goes past me until he hits my scent (in the air), and then he usually works the scent cone back towards me. When he finds me, we enthusiastically play with his favorite toy. Another new thing is teaching Loki to pull me on my longboard. I keep it short and easy so as to not stress his joints, but it’s a great way to practice verbal directive commands. And to take the edge off the wiggles! Loki is also turning into quite a camping dog. Last week was his first tent camping adventure in Glacier National Park over Memorial Day weekend. The two pictures I’m sharing here show our work on the down-stay (he’s not tied in either). You can see the drool starting to come with the cheese! That’s what happens to those who attempt to counter surf. He got no cheese. As always, we constantly incorporate sit-down-stay-heel-come into our daily routine. The heel is finally taking hold— at least 50% loose-leash on a flat collar, and his off-leash heel is almost better. The red harness he’s wearing in the picture is his working harness and includes a handle to help keep him safe on the chairlift. We are working on associating it with good listening and lots of fun search games. We are so delighted to see all that Loki has learned thus far–in such a short time. The development of his nose–scenting for the human is coming along nicely. The water work, the basic obedience, and all continue to come together. You are doing fantastic with him on every level. Thank you, for the diligent effort you are investing in training for the well-balanced (Search and Rescue ready) Weimaraner. Also, thank you for keeping us informed. We love being a part of the journey. We realize he is a typical Weimaraner in many ways (such as the counter-surfing thing); however, it remains to be seen what the two of you can become. Go Erica and Loki–we applaud your efforts. We took Berkley on her first canoe ride today! She was so funny!!! I set her in the water to swim and get some energy out and she followed us around. Then I lifted her back in and she just hung out with us. As we were approaching the beach we let her swim again. At first, she swam really funny…. Like our other Weimie did before he got the hang of it. But then she got the hang of it. It was so very fun. She’s doing really well on all fronts. I just had sinus surgery a week ago and she’s been my cuddle buddy as I’ve been recovering and resting. She’s becoming quite the guard dog and is more and more used to being off leash. We practice a lot, so she learns to come immediately. She still likes the bike rides, too. How are you guys!? Any new puppies? How are you feeling?! Thank you, for the great share. The photo is outstanding, too! We love the effort you put into Berkley and how she is a part of your family activities. 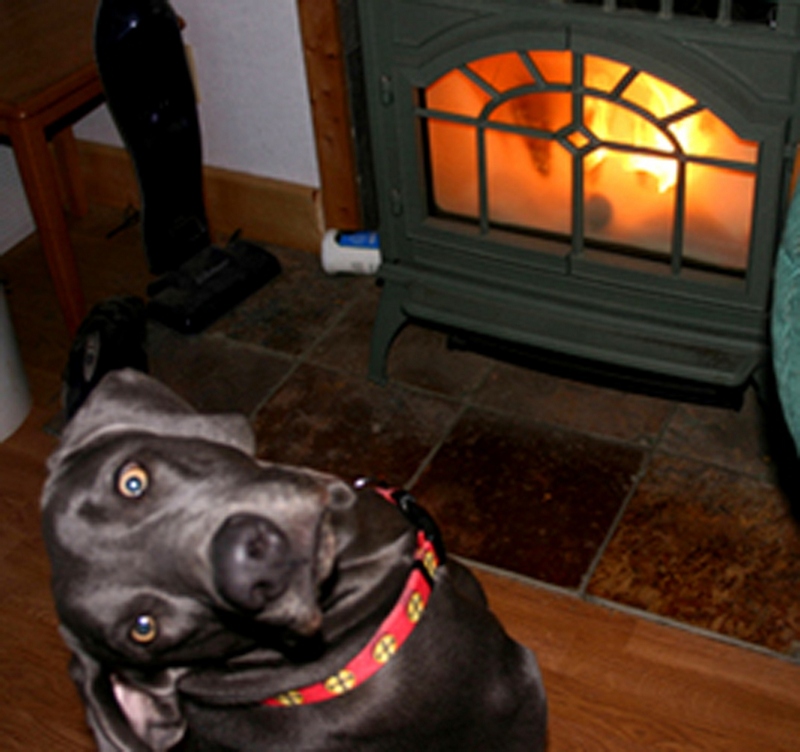 We appreciate that so many of you write about your OwyheeStar Weimaraner, and how you inquire about us as well. Yes, we have puppies right now–it is once again crazy-insane. (Forgive the terminology.) As for my health, I a lot better. I hope one day not to have the spasms and whatnot, but I am ever so thankful I am improved. We don’t think about a health crisis until one comes knocking. Recently, we have been discussing the Weimaraner and water. Many of you have succeeded beyond your wildest dreams. Others have doubts that you will ever see such a thing happen. Comments from some naysayers include the struggles with water in any form–the bath, the sprinkler, and for heaven’s sake that stuff that falls from the sky. It is out to get your beloved family member. Nevertheless, there are some that are Okay with a bath, and not with a pond. Some wallow in every puddle they find–the muddy ones are their favorite. Swimming has nothing do with their joyful mud bath. 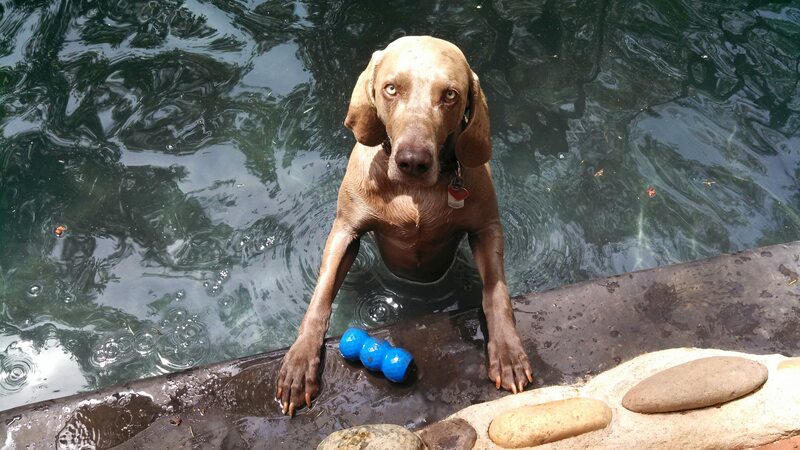 We have exhorted you to get the Weimaraner water-friendly. Achieving the retrieve and working them into a pond is how we at OwyheeStar approach this process. Nonetheless, Weims may swim for many reasons. Retrieve task just to be with me”. The Weimaraner is a powerful swimmer once they get going. The trick is getting to take the first step. Their toes are webbed making them better equipped to paddle. There is no one way to get them to swim; however, we find having a love of the retrieve ingrained goes a long way towards accomplishing this discipline. (Sorry to some of you!) For the non-hunter, many times the retrieve is not viewed as essential. All too many of you allow the Weimaraner to abscond and run around the yard with the toy or the bumper–instead of bringing back to hand. Yes, this is a hoot–although it is just one more Weim antic, this is one we suggest you not allow to take root. The idea of achieving the swim is only one reason in a myriad of why you need to get the rock-solid retrieve. We won’t list those as we are speaking about achieving the Water Retrieve. You want the Weimaraner coming when called. The Recall is a safety issue and the underpinning of compliance. Two areas where compromise cannot be allowed (in our opinion). Depending on your approach to training there are various ways to get this done–we will forgo the discussion on methodology. Let’s just say get this done! It is going to help you with achieving more than a Water Retrieve. Cliff suggests you find a place to do this exercise. One location that works well is a hallway. Close all the adjoining doors (so they cannot take off with the bumper of the toy). Make this a special event and stop before they tire–while they are still begging for more. He also suggests you use a dedicated toy or bumper you save for this activity only. Depending on your pup’s attention and skill level keep the number of reps down–at first maybe as few as three. Bear in mind; the idea is to make this celebratory and fun. You want them having the desire. This activity will serve you well on so many levels and enhance your training outcome positively. Weather Permitting the OwyheeStar puppy will see the water before they depart. You saw the video we shared, if not we included it here. Nevertheless, this is not going to ensure that your pup will swim. It will still require time, effort, and patience to get your Weimaraner to swim–plus a bit of knack. A few suddenly jump in but don’t wait for that to happen. Oh–and if you doubt, the Weimaraner is more than likely going to read your thoughts and agree with you. You might wonder how to begin. Cliff does it this way–your situation may require you to adapt. Using the reliable retrieve, you work along the edges of a pond. Just play in the water’s edge–a tiny bit on their feet initially. Slowly ease them into the water beyond their comfort zone. It might take a few tries, a few days, or a few weeks. It takes as long as it takes, but if you follow this protocol, you will achieve the goal. Like anything with the concrete thinking Weimaraner, you want to make this part of the early life training. Then it becomes the norm. Oh, and you notice he mentions using the pond. Waves could spook them. You want to avoid that scenario. Weims who balk at the sight of rain or a sprinkler often achieve the swim. Don’t go in with the *pre-conceived idea that it cannot be achieved. Select the venue to work on this carefully. Go in with the idea it takes as long as it takes. Make this part of your young pup’s agenda. If you *failed to achieve the swim early on, don’t believe it is impossible. Some people use a life vest**. The vests are not necessary. Often Cliff is teaching a Weimaraner who has not swum since they were a puppy. They might be 2 years old or older. They always learn. Cliff knows it can be achieved. Sometimes it is challenging but, with patience, it always happens. Deem this as invaluable to your process. It is a healthy activity that can burn off the excess energy and not take such a toll on the hips and joints. It is good for their cardiovascular as well. *You would be shocked to learn how many folks achieved the swim after they told us it was impossible. **Life Vests–just a note here that Cliff never uses one. The only vest he might use is a Neoprene one if he were to swim them in inclement weather–like for Duck Hunting. Some of you need this for peace of mind. It might help the Weimaraner take their first few steps, but again–it is not necessary. A lot of clients who live in cold water regions cannot keep their Weims out of the water. This scenario is true even in the winter. 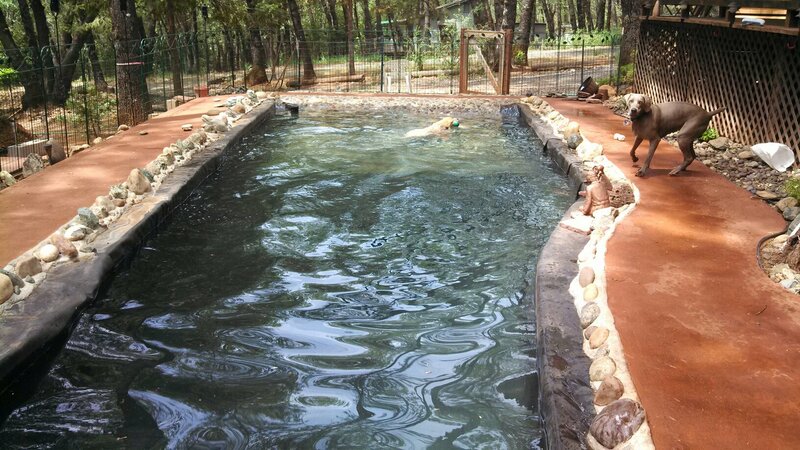 Here is a picture of the pond I had built for my babies Dusty and Stormy (Weims). Maybe you follow OwyheeStar Weimaraners both here and on Facebook. If so, you know about the late Stormy and our aging Dusty. These are not the same Weims–they are Virginia’s Stormy and Dusty. Ours and Virginia’s Weims are all the Blue Weimaraner. Virginia’s Stormy is a Blue Longhair Weimaraner. OwyheeStar’s Dusty is the father of both of Virginia’s pups. He is a smooth-coated Weimaraner (pictured to the left), but he carries the DNA marker for the Longhair. This Story originally ran some time ago.–click here to read the full story. Yesterday, we shared what happens during our puppy swim–something we do weather permitting with each litter. Doesn’t this guarantee the Weimaraner will take naturally to the water? No. Nonetheless, it expands their experience, imprints the idea of the water, and gives their family inspiration to keep them swimming. Not every Weim that swims at OwyheeStar takes to the water. This concrete-thinking breed can get a notion that they don’t want to do that. They can get spooked–that is never a good thing. If that happens, don’t make the mistake of ingraining the fear by babying them. Stay matter of fact and move forward as if everything is just fine–because it is. The extremes our OwyheeStar folks to achieve the Swim is impressive. The benefits are too many to list here. You know–it is a great way to get a lot of exercise without damaging the young Weim’s joints. It is a fabulous way to expend a lot of energy–speaking of the water retrieve. (Once the Weimaraner embraces that activity), then you have a lifetime of tossing the ball for the retrieve. We used to use a rocket launcher to toss the bumper way out in the reservoir. Cliff’s arm could only make so many throws–this solved that solution. Even then, we stopped sending before the Weims were ready. They would swim for the bumper until they could no longer go if allowed. If you are looking for Inspiration, look no further. Tomorrow — I want to post the pool/pond built for our Client’s Two Weims. Watch for that!